For a quick, and easy, last-minute addition to your Halloween Party food – try these Jellied Pumpkins. 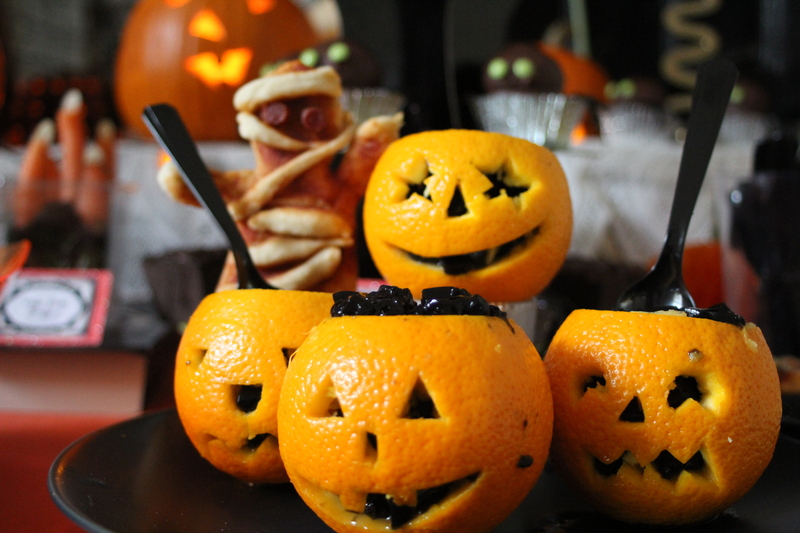 Our party guests couldn’t wait to dive into these fruity ‘pumpkins’ with their jet-black filling. They’re very easy to do – here’s how. Make up the jelly according to the instructions on the packet. While it is still a warm liquid add the food colouring – we added a couple of teaspoons, but you will be able to see how much food colouring to add, and it will depend on the type of food colouring you have. Pour your jelly into a shallow dish (this will help it set quicker) and put in into the fridge to set. Cut the top off your oranges in one slice. Carefully cut into your orange to make your ‘pumpkin face’. Remove the inside of the oranges with a knife and a spoon. When the jelly has set use a knife to chop it up into rough uneven pieces. Place on your table – we stuck black plastic spoons into our Jellied Pumpkins before serving. ← Halloween – Spider Delights!